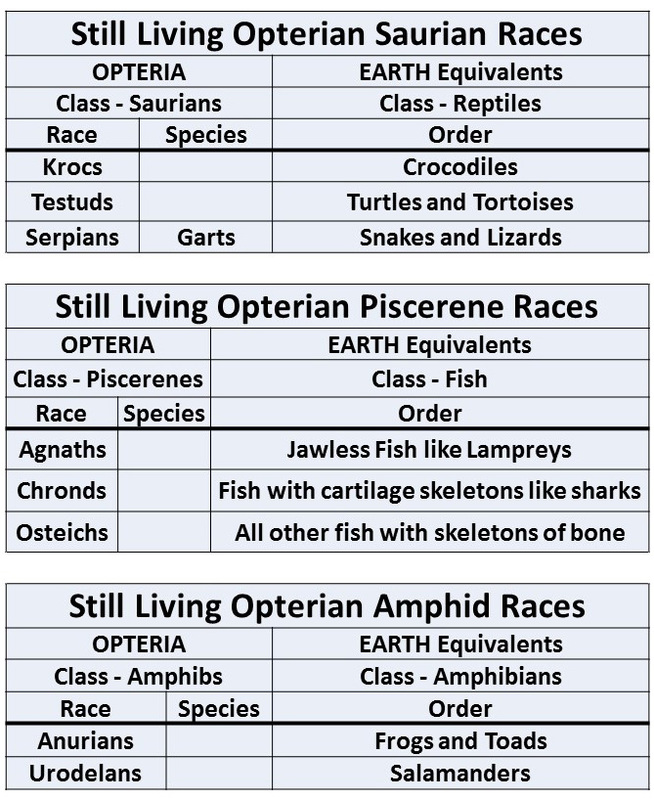 Note that the images and tables below can be clicked to enlarge. Opteria is a world of islands, some large enough to be called continents, others much smaller. By right of victory in the Avian Wars of Antiquity, the five continents of Falland, Sitta, Procell, Anse and Gall are known as the “Central Continents” although, as can be seen from the map to the left, this is not entirely correct from a geographical point of view. Procell sticks out like a sore thumb to the west of Sitta and between Sphen on the one side and Char and Adri on the other. The Islands of Gru also don’t fit the pattern either, being directly between Falland and Gall. Generally the continents of Sphen and Procell experience the most extreme weather patterns – very cold and wet in the Cold Time and warm and muggy in the Hot Time. The other continents have spells of very bad weather at the coldest time of the cycle of sola but temperate conditions at other times. Only the south-east of Gall and the islands of Alba and Apter experience desert conditions. The oceans and seas and all of the rifts, straits and channels are deep and generally difficult to navigate. This is also true of The Hole and The Eye. One exception to this general rule is the Straits of El, which, apart from large tidal fluctuations, is relatively safe. The various mountain ranges are high and forbidding and several coastlines have steep cliffs, dropping straight into the sea. Forests in Falland, Procell and Anse are typically coniferous, while Sitta has a mix of coniferous and sub-tropical trees. The trees in Gall are mainly found near the coastlines of the Bay of Elgar and the Sea of Dreams and are sub-tropical in nature. There are extensive grasslands in Falland, Anse and Gall. The Islands of Gru, Char and Adri, Sphen and Apter with its neighbor Alba, are inhabited by the banished races who were the aggressors in the Avian Wars of Antiquity. These islands are relatively inhospitable and life there is demanding and unforgiving. The Avian Wars of Antiquity lasted eight full Cycles of Sola and involved all of the avian races of the world of Opteria. The consequences were dire. Several of the avian races became completely extinct and several other races were seriously endangered. The remnants of the Apods, the Coracs and the Pics retreated to secluded areas of the central continents. The Pels were more numerous but not plentiful and were also displaced from their own lands. They now eke out their existence round the high cliffs of the coastal areas of the central continents and live on the sufferance of the new dominant races. The Struthions were also depleted and are now living in small nomadic bands of ten to fifty individuals, wandering the arid open grasslands of Anse and Gall. Three other races became landless in the wars – the Columbs, the Passerines and the Strigs. The Columbs remained widespread throughout the central continents and are smallish, quick moving people that work tirelessly for the major races in whatever country they inhabit. The Passerines are even smaller than the Columbs and are delicate beings most suited to the artistic aspects of Opterian society. They are good at camouflage and fly quickly from hideout to hideout so are very difficult to see. The Passerines also remain widespread in all of the central continents. One other race survived the wars in a depleted, landless state. This is the Strigs who were always renowned for their highly superior intellects. In the wars their peaceful ways worked against them and they were widely slaughtered. They only managed to survive by selling their services as spymasters, strategists and tacticians, advisors and all round wise men. Unfortunately for the dominant races, these people became very reclusive and elusive towards the end of the wars. Because of their persecution, the Strigs are now very difficult to find. 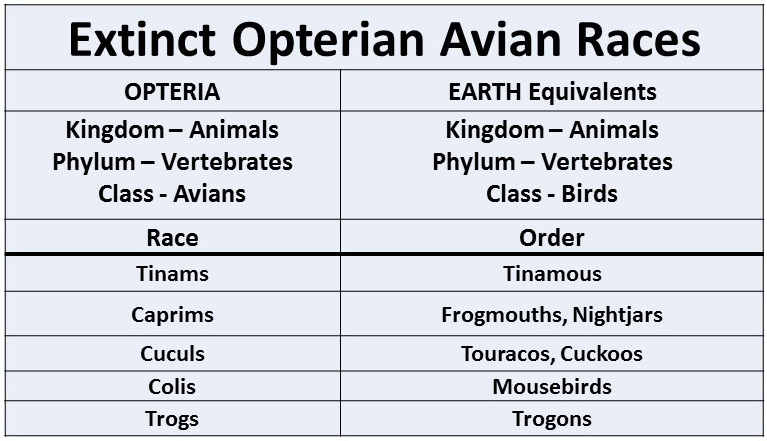 The Avian Wars left Opteria with five dominant avian races, the Fallons, the Anserese, the Sittacians, the Galls and the Procellarians inhabiting the major continents of Falland, Anse, Sitta, Gall and Procell. The major races had allied themselves together to thwart the invaders and had eventually been victorious. 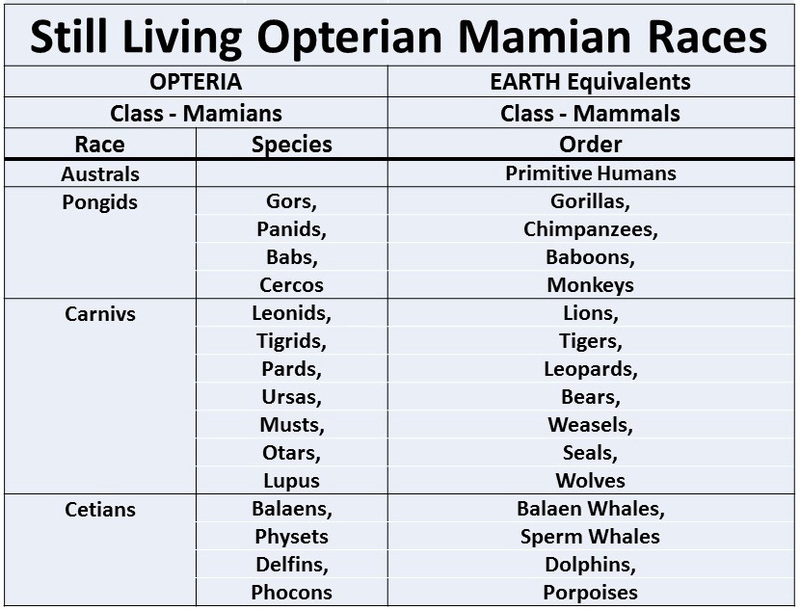 The four other races that had been involved in the conflict, were the races that had threatened the peace of Opteria. They had been defeated. At the end of the wars, the victors decided that these peoples must be contained so that they couldn’t again threaten the peace of the world. It was decreed that the four races would be relegated to the outlying continents of Opteria and would be restrained there forever. The Pygos were placed in the inhospitable continent of Sphen – separated from the central continents by the Channel of Outcasts, the Grey Sea and the Barrier Channel. All three of these bodies of water are dangerous and difficult to navigate. The Jacans were moved to the large Islands of Char and Adri. The deep and dangerous Main Channel and the equally treacherous Straits of Pod separated these islands from the rest of the continents. The Droms were allocated the Continent of Apter, a hot and dusty place that barely sustained life. This continent is separated from Gall by the Sea of Dreams, a body of water littered by reefs and shoals. The Straights of Apter lie between Anse and Apter. These straights are bottomless and filled with eddies, whirlpools and murderous currents – certainly not a pleasant place for a quiet sail. Finally the Sitors were scattered amongst the Islands of Gru, a chain of barren, windswept lands buffeted by cruel seas. The unpredictable weather of the Sea of Soemmer, the Straits of Cor and the high seas of the Broken Channel make movement from these islands a perilous task. Thus the victors in the Avian Wars of Antiquity sought to imprison the vanquished. And for many cycles of Sola the strategy worked. A body of Myths, Legends and Prophecy has become fundamental to the beliefs and values of the Fallons, in particular, and to other avians in general. Central to these are the recurring themes of an alien savior and the power of the Creator’s Egg – an ancient artefact imbued with magical capabilities that have the power to harness natural forces and the Supernatural in defense of the races of Opteria. Supporting the Egg are two other Talismans – The Swords of Freedom that must be wielded by a master of skills long lost to the world of Opteria and the Orb of Truth that provides insights, visions and abilities to attack and defend against oppressors. Unfortunately these talismans were lost at the end of the Avian Wars of antiquity – a conflict that nearly destroyed Opteria. The race of Strigs were the original custodians of the Talismans and the elders of the wandering Struthions are the protectors and memories of the myths, legends and prophecies of the avians as well as being the historians of the world. 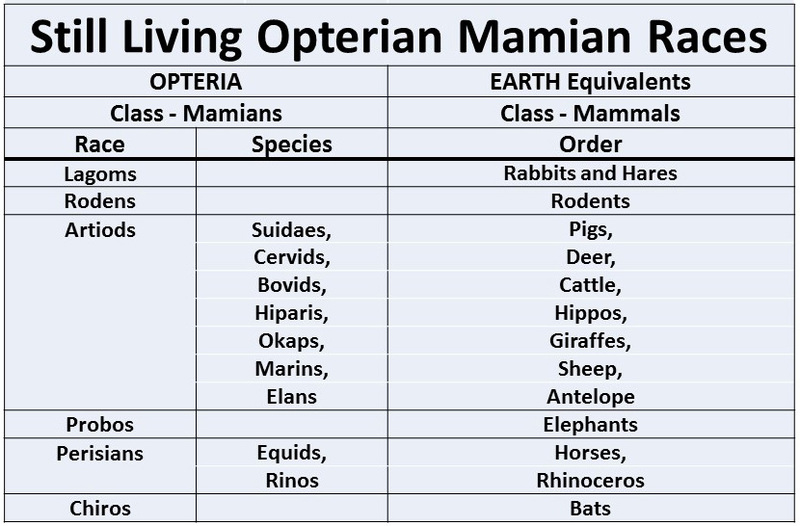 Opteria is a world that is younger than Earth and, there, evolution has favored birds instead of mammals. 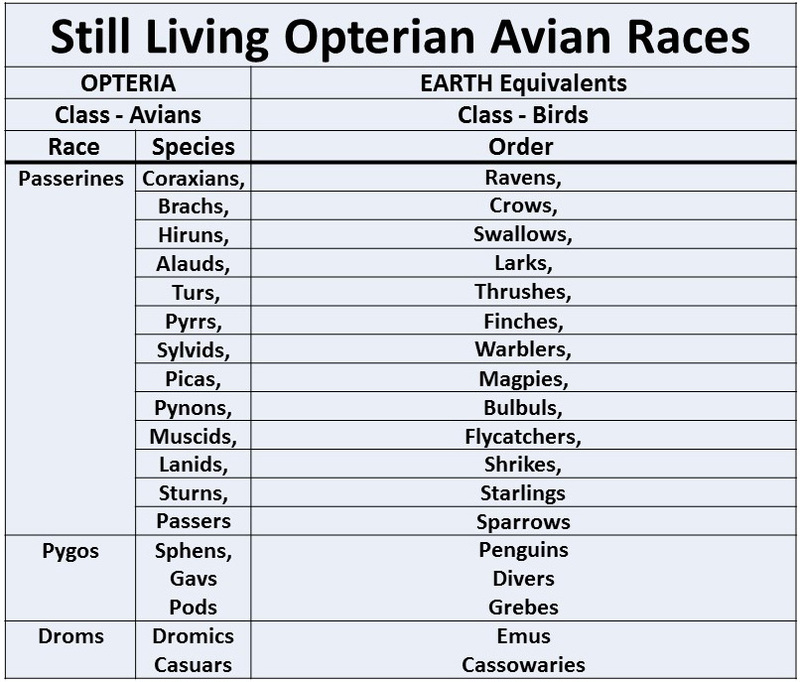 The dominant races of Opteria all are birds with very human characteristics. An evolutionary development on this planet is a six-limbed vertebrate skeleton. This has provided much more scope for adaptations than on Earth. This skeletal development has resulted in “birds” with both wings and arms, as well as an enhanced, upright walking stance that parallels that of humans on earth. 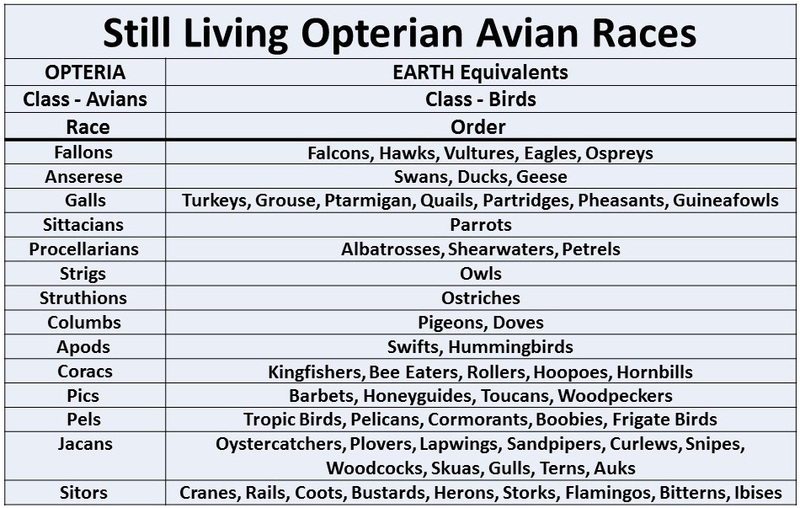 Thus the birds of Opteria, have all the evolutionary advantages enjoyed by humans on Earth – but also the power of flight. Social development has reached the early middle-ages state of earth with technologies of wood, stone, bone and hide as the main raw materials. Metals are as yet unknown. A second evolutionary adaptation that has set the birds of Opteria apart is the development of a “language-translation cortex” in their brains. This feature arose from innate talents for mimicry but evolved to a level of sophistication that gives all advanced avians (birds) the ability to quickly assimilate language in all its forms. This gives them the capability to rapidly understand and communicate with each other and other sentient beings, regardless of origin. 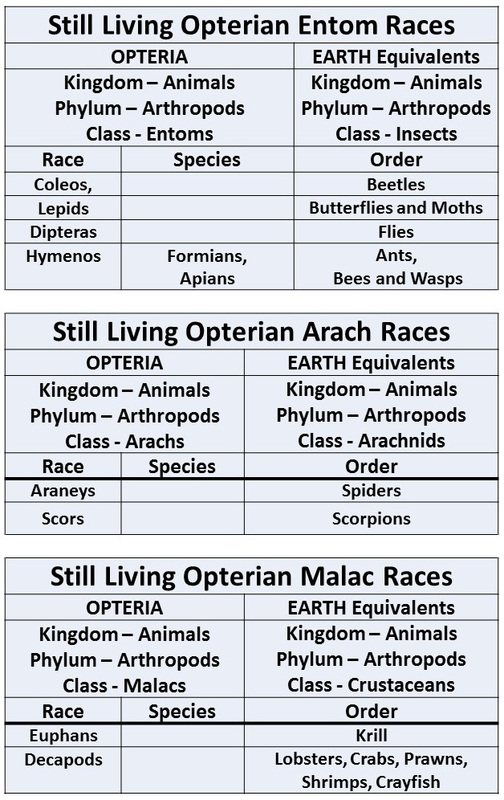 The life on Opteria is taxonomically similar to earth but somewhat simpler in structure. 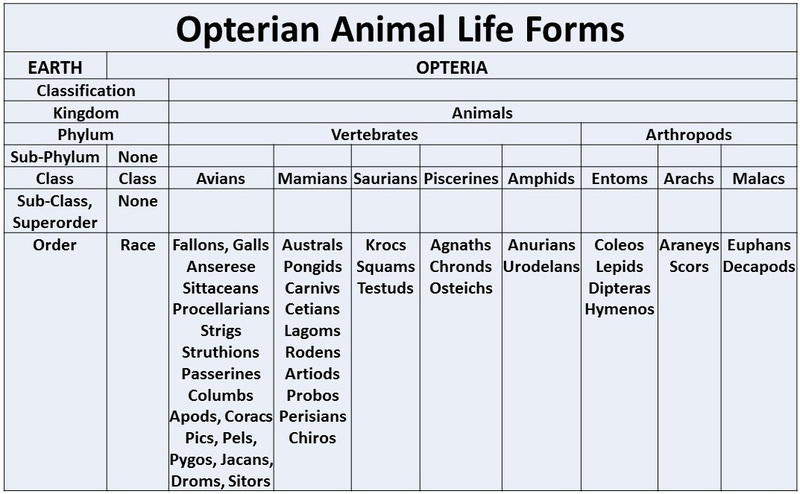 The following tables summarize the relevant animal life forms that feature in the series.